Los Angeles mayor Eric Garcetti is catching heat this week for making comments that expose his continued embrace of unproductive, NIMBY-fueled, anti-housing rhetoric. 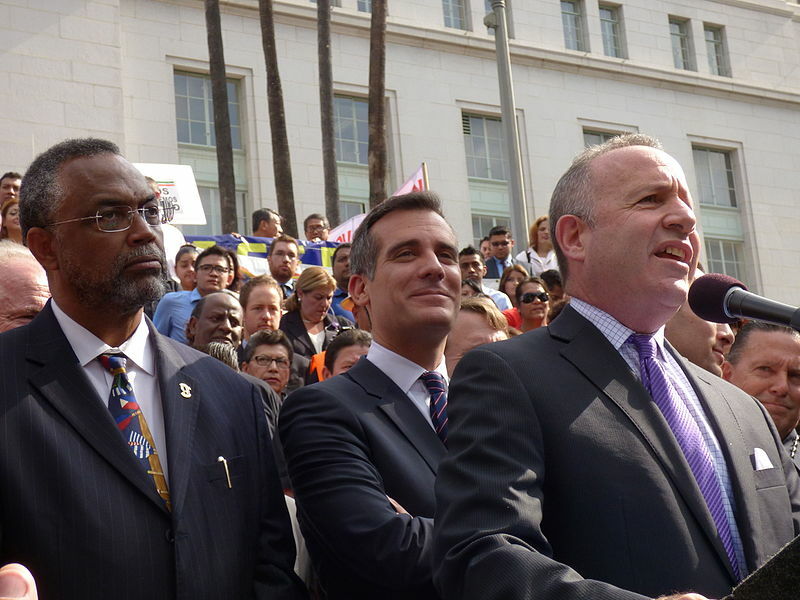 At issue is a reversal in Garcetti’s support for a controversial state housing reform bill known as SB-827, a measure that would lift arbitrary restrictions on building heights and abolish costly minimum parking requirements for development sites located up to ½ of a mile from rapid transit stops across the state. In response to these concerns, State Senator Scott Weiner—one of the politicians behind SB-827—has proposed a series of pro-tenant amendments that would keep local demolition controls in place, allowing cities to forbid the destruction of rent-controlled housing or historic structures, for example. The bill will now also allow local inclusionary zoning plans to remain in place, ensuring that developers will continue to meet prescribed affordability requirements. The biggest addition will require developers to guarantee the so-called “right-to-remain” for existing residents, where developers pay people to stay in their neighborhoods despite new market-rate developement. Aside from seeking to keep L.A. locked into its suburban past, the mayor’s view that major housing legislation focus on preserving single-family zoning is seemingly at odds with the commonly-accepted solutions to California’s persistent and worsening housing affordability crisis. Experts agree broadly that the crisis is chiefly one of under-building resulting from the type NIMBY-fueled sentiment Garcetti expressed at the luncheon. Across the state, an overabundance of single-family zoned land and a resulting deficit in construction of new multi-family units, especially near high-capacity transit routes, is pushing housing out of reach of millions, burdening households with high rents, and forcing thousands into homelessness. Schools are closing in the Bay Area because families can’t afford to live there. Critical personnel—school teachers, medics, firefighters—face excruciating commutes because the only affordable communities are far-flung. 58% of Angelenos are rent-burdened, nearly 56,000 people in Los Angeles are experiencing homelessness, and California was recently ranked last in terms of quality of life in a recent U.S News and World Reports survey. The list of negative impacts resulting from the housing crisis goes on and on. And yet, to Garcetti, dense housing still doesn’t quite fit. The human cost of the crisis aside, Garcetti’s views miss the mark environmentally-speaking as well because single-family zoning bakes in auto-oriented lifestyles, fuels traffic congestion, and drives transportation-related greenhouse gas emissions. Today, transportation emissions make up the bulk of California’s contribution to climate change. As has been said repeatedly, without greater investment in mass transit and density, the state will be unable to meet its ambitious climate goals. Garcetti’s comments also fail from an investment value-capture point of view—How can the state benefit from billions in new transit investments when only a select few have access to new metro lines? Given that the mayor strongly championed the multibillion dollar Measure M transit initiative in 2016, it would seem prudent to invest in—or at least allow—density near those lines. But instead, with the insistence that single-family zones be preserved, Mayor Garcetti risks undermining these new transit improvements in addition to extending the negative effects of the housing crisis even further. And for what? Whether the mayor is willing to accept it or not, if California is to truly embody the progressive ideals so many of its state and local leaders espouse, it must drastically reduce the amount of urban land dedicated to single-family housing. There is simply no other way around it. If he wanted to deflect development energy from single-family areas, the mayor could issue any number of constructive reforms, like lifting the prohibition on housing in L.A.’s commercial corridors, for example. Given Garcetti’s comments and track record so far, however, this seems unlikely. Instead, the conversation will continue to focus on the specious claims of housing-secure residents unwilling to make room for others.